How Much Does it Cost to Repair a Sewer Line in Richmond, Virginia? When the sewer line fails, at a minimum, you’re in for a major inconvenience, and at the worst, you’ll have a smelly mess in your yard or a sewage backup in your house. Sewer lines are one of the most crucial parts of your household plumbing system. Without a properly flowing sewer line, you could have waste and sewage back up into your house causing a huge mess or even extensive water damage. Sewer line repairs are one of the most difficult jobs to estimate up front because the scope of the required work is relatively unknown until the cause is fully researched. Sometimes sewer lines just get clogged. Evidence of a sewer line clog could include water backups in sinks, tubs, and toilets. Look for water to back up at the lowest source first. Sometimes this could be in a basement floor drain, or in a basement utility sink. Sewer line drains can become clogged from a variety of sources, and depending on the age, condition, and type of material your sewer pipes are made from, your home could be more susceptible to sewer line clogs. A plumbing technician can use special equipment to free a clog. In some cases, video inspection equipment is used to identify the source of a clog and to evaluate the condition of the pipe. As a result, video inspection services could identify other issues with your sewer line, too, such as excessive corrosion or tree roots growing into the pipe. In these cases, your sewer line may need to be replaced. For video inspection services, and clearing a clogged drain, prices for a plumber in Richmond, VA start at about $225. 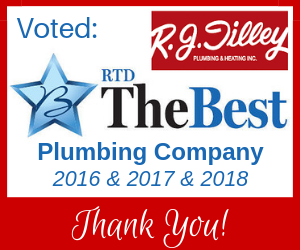 If you suspect you have a clogged drain anywhere in the Richmond, VA area, the professionals at RJ Tilley will be quick to respond. Contact us at 804-355-7110 to request an appointment. Sewer lines have a limited life span but should last between 35-75 years depending on a variety of factors including the pipe material, soil conditions, and the amount of use. When it comes time for sewer line replacement, it can be a costly and disruptive project. Usually, the full pipe would need to get exposed, which means your entire yard would need to get dug up. The cost for a sewer line replacement will vary greatly based on the length and depth of your sewer line. Expect to pay for labor and materials for your sewer line replacement. The majority of residential sewer line replacements in the Richmond, VA area cost between $3500 and $6500. Contact the professionals at RJ Tilley if you suspect you need a sewer line replacement. Our team will guide you through the process and will quickly and efficiently get the work done. We’ll even assist with returning your yard to its previous condition. To request an appointment for sewer line replacement in the Richmond, VA area, contact RJ Tilley at 804-355-7110.